On June 27, Toronto knuckleballer R.A. Dickey gave up four home runs in a 5-4 loss to the visiting Chicago White Sox, falling to 6-7 with a 4.24 ERA this season. A few things of note here: Dickey’s four dingers allowed gave him 10 surrendered over his last five starts, which accounted for 13 of the 14 runs against him in that span. The four homers by the White Sox – including two hit by rookie Jose Abreu, who’s now got 25 on the season and is more than halfway toward breaking Mark McGwire’s rookie record (49 set in 1987) – were the most Dickey had allowed since giving up six against Detroit on April 6, 2006. That game happened to be Dickey’s first big-league start as a knuckleballer. Interestingly, in Tom Candiotti’s career, the most number of home runs he ever gave up in a game was three. In his first major-league start as a knuckleball pitcher in 1986 – in his first two seasons he wasn’t a knuckleballer – Candiotti gave up only one run, and that was a homer hit by Rick Dempsey. In fact, that home run was hit off of a Candiotti fastball; otherwise, he would have pitched scoreless ball that evening against the Orioles. Also, June 27 was the anniversary of the Candiotti trade from Cleveland to Toronto in 1991. He finished with an undeserving 6-7 record with a 2.98 ERA as a Blue Jay. Dickey, of course, is 6-7 for Toronto right now with an ERA that is much higher. One more point about the home runs: According to newspaper accounts during that 1991 season, almost none of the homers hit off Candiotti – he allowed only 12 in 238 innings – came off of the knuckleball. Nearly every one of them came on a curveball or fastball, in situations where he didn’t want to pitch around hitters, where he wanted to go right after the hitter with runners on base. Among the homers Candiotti allowed in 1991, at least four of them came off of fastballs, with Joe Carter, Mike Greenwell, Kevin Maas, and Juan Gonzalez doing the honors. Robin Ventura hit a grand slam off of him on a slider (one of just three bases-loaded homers over 451 major-league games for Candiotti). Tom Brunansky and Carlos Martinez hit curveballs off of Candiotti out of the park as well. That would be a total of seven homers at least, coming off of something other than a knuckler. The other home runs Candiotti gave up that season were not indicated in the newspaper recaps for those individual games. 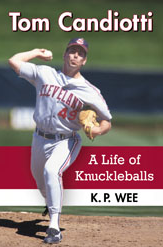 “Tom Candiotti: A Life of Knuckleballs,” a biography of former big-league pitcher Tom Candiotti, will be released in July of 2014. You may pick up a copy either from Amazon.com or through the McFarland & Company website.